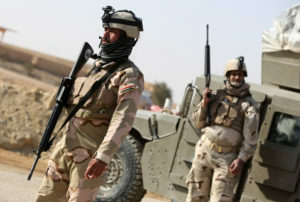 WASHINGTON — Iraqi troops killed at least 57 Islamist, anti-government militants in the western province of Anbar. The province, and the cities of Ramadi and Fallujah, have been the focus of al-Qaeda-affiliated groups seeking to destabilize the country. Reuters reported that the group, the Islamic State of Iraq and the Levant, had played a role in the Syrian civil war and is now sending fighters across the porous Syria-Iraq border into Iraq. In a guest column last year, Lt. Col. James Zumwalt of the Marine Corps wrote a piece on why losing Iraq to al-Qaeda is a major blow to the U.S. and Iraqis. He believed that a destabilized and chaotic Iraq only strengthened Iran, an enemy of Saudi Arabia and Israel (key American allies in the Middle East region). U.S. Secretary of State John Kerry said that the U.S. will not send troops into Iraq to help the Iraqi government, but will provide support from afar. The Iraqi government is sympathetic to the majority Shi’a Muslims, while the minority Sunni Muslims are allying themselves with the al-Qaeda militants. The government has taken to swift executions to eliminate possible terrorists, which the international community has condemned. After taking the city of Fallujah, which was a major victory for the Americans when they liberated Iraq, the Iraqi government pledged to launch a full-scale assault on the city. The attack was called off, for now, to mediate an agreement. But, those plans look like they have fallen through. Hundreds of Iraqis have lost their lives in the Sunni-Shi’a violence since last year, stoked by al-Qaeda militants within the country.